The Fourth » What, no giant shark? Hey thanks for the birthday wishes guys! Here’s a depressing comic. It’s ok Peter, I’ll hold you, and you can use the rest of Skärva’s cape for a tissue. Man, if Skarva could get that kid in his element, I’d like to see Skarva go all shark-mode on him. Use the gods’ hatred to his advantage. Did you see that newspaper headline back in comic whatever-something when they were on the tram? Skärva IV doesn’t worry Blank in the slightest. I don’t know if the gods’ hatred could ever be an advantage, but if so Skärva would be well-nigh unstoppable. He isn’t weak though, nor is he incompetent. One of the main themes of the entire comic, one of the things that inspired me to make a story about a game villain, is the thought of how much pre-game preparation they must go through that you don’t see, and how powerful they obviously are, only to be brought down by some kid, or guy – one or two or at most a small team of “normal people”. How ridiculously unfair and improbable and spirit-breaking that must be. oh yea. r u guys gonna update the banner and cast? Soon. Blankity Blank needs to be up on the cast page. Also I will make a new banner as soon as I can get ahead and am not just scrambling to get the pages up on time Then Blank will not look like such a derp child and they will all be freed from that dreadfully thick lineart. dont worry skarva, ull get ur chance to be that over powerful boss sometime, just make it harder to find the next pieces of the weapon that can affect u. Me too. …As if it wasn’t me who did that to him… but I still feel so bad! I can’t lie, I lol’d at panel 3. …then was sad with the last. Though that’s pretty generous of Blank to let him go! Of course, that’s the heroic thing to do, right? If at first you don’t succeed, try try again Mr. Skaerva. Thats cold,even to me,let him get blank in the water next time,see how well he does then,especially if the water thing is only the gimmick for that one boss room and the rest is Ice or maybe Fire themed,cus just think,blank finds random item for putting out any fire or whatever,finds out,OOPS skaerva’s boss room is a huge pool of water,or maybe just full of water,Ideneu,something cool like dat,that the dungeon item is completly useless in,Blank will die n-ICE-ly in such a situation I think…..
He’s really good, but Skärva will get him yet. Right? He will at least keep trying, in spite of… *looks at today’s comic* this. A villain is quite courageous too, huh? Yes we do. 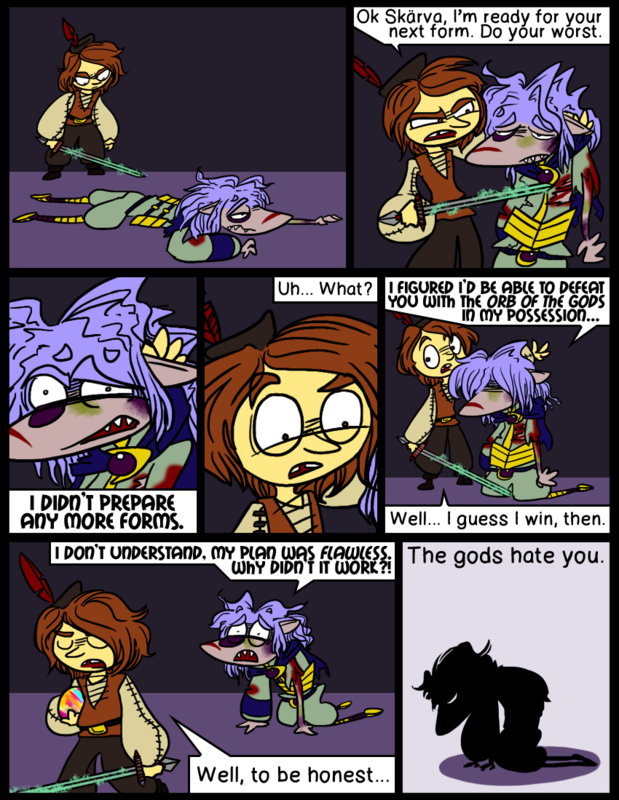 The gods can take the Sword of Stabbing and shove it. ahhhh the sadness… it fills me with tears! And here is where we really get a sense of the purpose of this comic. Very well done! This is going to sound terrible…but I really like that shot of Blank in the first panel, very dramatic. And how he practically demands for a next boss form at swordpoint in panel two. Blank seems very “bring it on!!”. Too bad he’s got to do so well at the expense of poor Skaerva. I swear, your comments/replys are sometimes more funny than your comic, which is saying something as each comic makes me laugh a lot (well, with exception of this one…and maybe a few more serious/cute ones…but they’re all still just as good). “Robbing a pawn shop = secondhand stealing” being compared with spoils from a defeated game villain will have me chuckling for a week. “red krogan” was my captcha. Anyone play Mass Effect? I’m glad you think so. I love talking to you guys. In that case, switch religeons. Find yourself a god who won’t deny you Grace over something your great grandpa did. Rereading this, the “No giant shark” title is hilarious in hindsight.